The Firestone Grand Prix of St. Petersburg is a Verizon IndyCar Series race held in St. Petersburg, Florida. The 2008 Honda Indy 200 at Mid-Ohio presented by Westfield Insurance was the twelfth round of the 2008 IndyCar Series season. It took place on 20 July 2008. The 2002 CART Grand Prix of Mid-Ohio was the eleventh round of the 2002 CART FedEx Champ Car World Series season, held on August 11, 2002 at the Mid-Ohio Sports Car Course in Lexington, Ohio. The 2009 Rexall Edmonton Indy was the eleventh round of the 2009 IndyCar Series season, and was held on July 26, 2009 at the 1.973-mile (3.175 km) Rexall Speedway in Edmonton, Alberta, Canada. 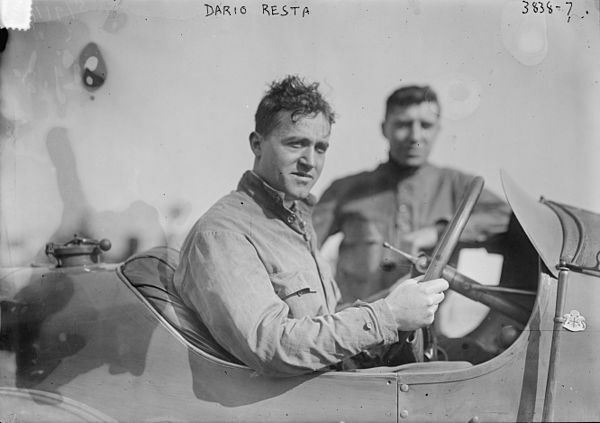 Dario Resta (17 August 1884 – 2 September 1924), nicknamed "Dolly", was an Italian Briton race car driver. He was the winner of the 1916 Indianapolis 500.